"There were bands like Can in Germany, Nurse With Wound in UK, The Residents in USA, and there were Deficit Des Annees Anterieures in France. Formed in 1979 by 3 artists from the Beaux-Arts of Caen: Jean-Luc André, Sylvie Martineau-Fée, Jean-Philippe Fée; DDAA was one of the leaders of the independent, experimental, industrial 80s French scene with their highly artistic, peculiar and thoughtful vision, which is brilliantly illustrated by their own label Illusion Production (more than 40 references published). This undoubtedly makes DDAA one of the most outstanding bands of the French underground over the last thirty years! Behind this radical and utopian group are three self-taught musicians of high creativity with a surprising and rich discography, around thirty titles released under all formats: vinyl LP, singles, 10", tapes, CDs and many compilations (some deleted titles are still very collectable today). 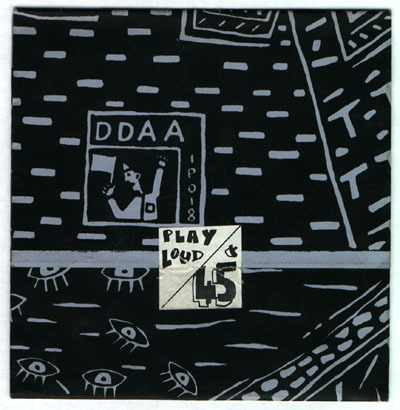 From a post-punk/avant-garde/surrealistic music made by improvisations and collages, DDAA created an odd and captivating world, somehow naive but truly emotional. Eternal travellers from the imaginary (into space and time), after they ventured in Africa (1980), in the Maracayace land (2000), in the Russia of the Tsars from the 19th century (Les Ambulants 1984) or even with the French poets from the 16th century (Ronsard 1988), DDAA went to Japan with Action and Japanese Demonstration in 1982. And they will be well inspired by the land of the rising sun, so its no surprise to see them, the next year, on the Paris-Tokyo compilation and also in the Pascal Comelade album Detail Monochrome (1984) on the track Pluie Japonaise. First full-length vinyl album (Illusion Production -- IP010) and a cornerstone in their history, Action and Japanese Demonstration is considered by many fans as one of the best DDAA works to date. A fascinating album! Ten actions and poetic demonstrations like Japanese woodblock prints (ukiyo-e), refined and entrancing atmospheres, drawn and played by the 3 dadaïsts with synths, vocals, chorus, crazy guitars, percussions, rhythms box, flutes and noises and Bernard C and Marcel Kanche on sax. For a long time unavailable, this album is finally reissued on CD for the first time with 2 unreleased tracks from the same recording session plus 20 minutes bonus Musique et Bruits du Bas Pa-Tât, a collection of 7 rare tracks from 1985 originally released on tape for the very limited Jean-Luc Andrés comic strip titled Mutants du Kwantung. This is a dark ethnic report which brings you in the primitive southern China before Jesus Christ. This CD reissue is an exact reproduction of the vinyl LP, and is packaged like the original in an heavy card sleeve hand fold plus a 16 page color booklet with all inserts, texts and unreleased pictures (DDAA live in 1979!). Remixed and remastered from the master tapes, this gem is now available again after more than 25 years. Action and Japanese Demonstration is a pure delight, a kind of improbable meeting between the famous artist Joseph Beuys and the master of the ceremony Sen No Rikyu. Splendid!" - Fractal.